What is the Dive-in Theater? The Dive-in Theater is a marine education boat cruise developed by Diver Ed. Ed dives underwater while you watch live on the on-board movie screen. He also collects sea creatures and brings them up for a hands-on show-and-tell before they go back to the sea. We highly recommend you purchase tickets in advance, as cruises do sell out quickly. To maximize your chances of getting the day you prefer, please book well in advance! 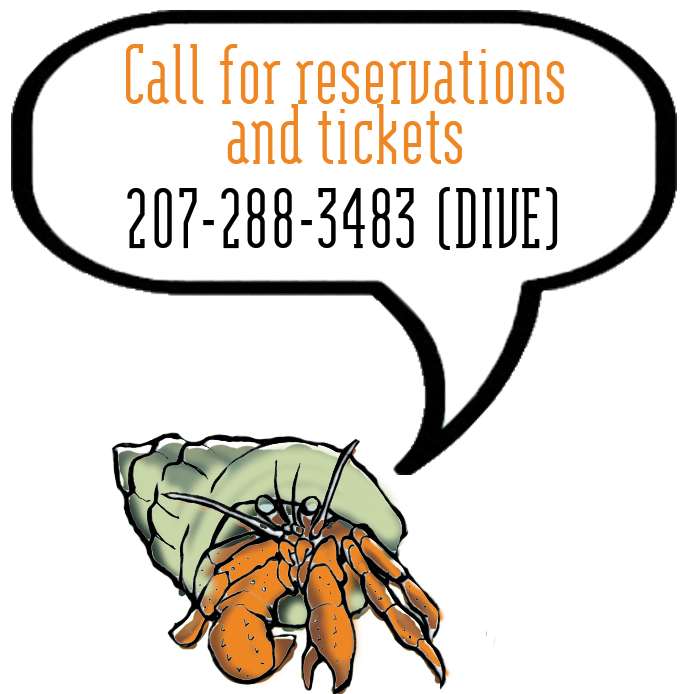 Call 207-288-3483 (DIVE) to make your reservation. Is the Dive-in Theater for kids only? No! Even though Diver Ed’s zany tactics may not be appealing to the truly dignified, most adults agree that they enjoy the Dive-in Theater as much as the kids do. What’s the story on Diver Ed? Diver Ed is an entertainer, ecologist, and extraordinary diver, with over 35,000 hours underwater, most of it off of Bar Harbor. His knowledge of local marine life is astounding. 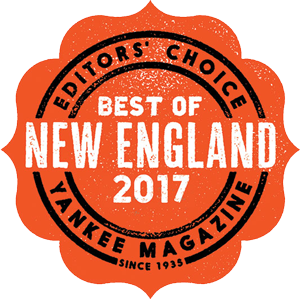 His experience as a commercial fisherman and Harbormaster in Frenchman Bay make him an excellent captain and seaman. Diver Ed has worked with kids of all ages and helped with special needs children. His love of diving and teaching really shines through. And what about “Captain Evil” Edna? “Captain Evil” Edna is a licensed Coast Guard Captain with experience on the Seal, our old boat, and the Starfish Enterprise. Unlike her name (given to her by Diver Ed), she is incredibly sweet. She is a child psychologist and is awesome with the kids. Edna is also Ed’s wife, dive tender, and topside naturalist. The tour runs rain or shine. The boat has some shelter, so you will be protected from the elements, but we still recommend that passengers dress for the weather. We meet up at the Dorr Museum (an Island Explorer bus stop) at College of the Atlantic, so you’ll be sheltered as you wait also. In the event of unsafe or severe weather, we may have to cancel the cruise, in which case you would be able to reschedule your tickets or receive credit for a future event. Do you ever cancel trips? It is rare that we have to cancel a trip. There are times that strong winds or rough water, even on a lovely day, can cause us to cancel a trip. If we feel conditions on the water are unsafe, we will cancel a trip and reschedule or refund your tickets. If you are worried about the weather, do not order your tickets until you are able to check the weather for that day – usually about a week in advance. Remember, unless a trip has to be canceled, tickets are non-refundable. Is there a bathroom on the boat? Yes. We have a small bathroom on the boat without running water. We recommend that passengers use the more comfortable restrooms in the college’s museum or Arts and Sciences building adjacent to the meeting area before the cruise begins, but there will be a bathroom on board in case of emergencies. Do we see seals on this tour? Maybe – but probably not. The seals stay farther out than we usually go. The best time to see seals is around low tide, but of course we cannot guarantee that you will see any. Yes and no. We might see harbor porpoise, which are small toothed whales, like dolphins. But as far as the big whales, we only see a handful a year, and each year is different. What animals might we expect to see? There is no knowing what Diver Ed might bring up! Typical critters include sea stars, sea cucumbers, crabs, lobsters… but there is so much more, and each day is a surprise! Can I take a stroller on the boat? No. The Coast Guard requires that the aisles be clear on board, but you can leave a stroller safely at the dock while we’re out on the boat. Probably not, the Starfish Enterprise is a very smooth boat. Even so, if you are prone to motion sickness, you may want to consider taking preventative measures beforehand. We meet outside the Dorr Museum of Natural History on the campus of College of the Atlantic (105 Eden Street). Due to construction, DO NOT PARK ON CAMPUS. They will tow you. Instead, you can park just across the street at Acadia Inn (98 Eden Street). You can also park in front of the Conference Center at Atlantic Oceanside (119 Eden Street), which is a 5-minute walk from the Museum. Bring warm clothes, appropriate foul weather gear, binoculars, food or drink if desired, and a spirit for adventure. Can I bring food or drinks with me? Feel free to bring any food and beverages you’d like! However, we do not allow alcohol on the boat. Dress warm and in layers. It can be as much as 20 degrees cooler on the water than in town. Wear foul weather gear if the forecast is for rain. Can I bring my pet on the boat? No. Diver Ed has Newfoundland dogs that work on boat for water rescue and can be confined if need be. Other pets will not have that luxury. Are there life jackets on the boat? Yes, there are enough Coast Guard required life jackets available on board for each passenger, but they are stowed and prepared for an emergency. They are big and bulky and not so fun to be worn around the boat! You are welcome to bring your own life jacket if you wish. The Starfish Enterprise is 54 feet long, and plenty wide. She is an extremely comfortable and stable vessel specially designed and built specifically for the Dive In Theater. What happened to the Seal? Yes, many of you who have been out with us in years past remember our beloved old boat, the Seal. Sadly, on Thanksgiving in 2008, there was a violent winter storm which snapped her mooring and sent her crashing into Bar Island. But, many community gatherings later – the new boat was envisioned, named, and brought into being. Is it physically challenging to get on to the boat? There is a short and fairly easy walk from the gathering point at the Dorr Museum down to the dock. The walk becomes steeper near the coast. The gangway to the dock changes with the tide. At high tide the slope of the gangway is gentle, but at low tide it is very steep! Please call us at 207-288-3483 (DIVE) if you have questions about this. Is the boat wheelchair accessible? No. Unfortunately there is no wheelchair access to the boat. Passengers with other types of handicaps will most likely be fine. If you have mobility issues scheduling a cruise around high tide is the best. Does your boat have a glass bottom? No. The Dive-in Theater utilizes a LCD projector shining on to a six-foot screen to show you the picture from Diver Ed’s video camera. Can I take video or photos? Yes. Please feel free to bring along any camera equipment you would like. Please be considerate of other passengers and try not to disturb them if possible. If you load photos online, or videos on YouTube, we’d love to know about it! Can I book a private charter? Sure! Private charters are great for any special occasion. If you’re interested in chartering the boat, please call 207-288-3483 (DIVE) and we will help arrange an unforgettable event for you. No, we are sorry, but we do not offer gift certificates at this time. FOG AND RAIN DO NOT AFFECT THE CRUISES! Cruises go out in almost any weather. If bad weather is an issue for you, please check the weather before you reserve. Tickets only available by phone, and advance purchase is required, as trips often sell out.